This is a list of coats of arms of Germany. The origins of the coats of arms of German federal states covers the historical context for the current arms of the German länder. After the end of the Third Reich, Germany had lost significant parts of its territory and was divided into four occupation zones. Several former states were split between two or more of these zones. The historical state of Prussia, which spread over more than half the territory of Germany, was officially abolished by the Allies; and several new states were formed from its former lands while other parts were annexed by Poland or the USSR. Some of these states were direct successors of former states, although the former borders changed; others were new constructions. In some cases parts of former states were declared states; in other cases, parts of different states formed a new state. Only the historic city-states of Hamburg and Bremen survived the end of the Third Reich without significant changes of their territory. The Federal Republic was joined by the Saarland in 1957 and by five states of the former German Democratic Republic in 1990. Each of these states adopted new arms upon joining the federation, by combining the centuries-old coats of the former states (or ruling houses) from whose territories they were formed. Preceding states (Zollern, Hohenzollern-Sigmaringen, Hohenzollern-Hechingen and the Province of Hohenzollern) until Württemberg-Hohenzollern used these arms; rulers chose variations and additions thereupon. For history, see Mecklenburg-Schwerin, Mecklenburg-Strelitz and Duchy of Pomerania, predecessor states. For history, see also Rhine Province, Province of Westphalia and Principality of Lippe, predecessor states. Coats of arms of German colonies were prepared but never formally granted. In 1914, the diplomat William Solf proposed that Germany's colonies be assigned flags and arms, like the flags and arms used by the British colonies. Solf believed that these would serve to advertise Germany's power, and would encourage German pride amongst the colonials. Emperor William was enthusiastic about the idea, and drafts were prepared for his inspection by Solf in conjunction with the Heraldry Office and the Duke of Mecklenburg. However, World War I broke out before the project was finalised, and the arms were never actually taken into use. This was in part because giving the colonies their own insignia in times of war could have let them have symbols to rally around in rebellion. Following the defeat in the war, Germany lost all its colonies and the prepared arms were therefore never granted. The arms all followed a similar style. In chief was placed the Imperial Eagle, bearing a shield with the arms of the House of Hohenzollern. 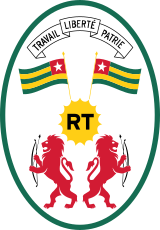 In the main part of the shield was a colony specific symbol, such as an elephant for the colony of Kamerun. Above the shield was placed the German State Crown (which was merely symbolic, and did not physically exist). Early drafts included a scroll displaying the name of the colony or protectorate in German, but given the unheraldic nature of such a name scroll, it is unlikely this would have been part of the final blazon. ^ The Emperor's new coat of arms (Spiegel Online, 26 February 2009, in German). ^ Schurdel, H.D. Battenberg (1995). Flaggen & Wappen Deutschland - Heraldik, Hymnen, BRD & DDR Flaggen und Wappen, Deutsche Ostgebiete, ehem. deutsche Kolonien u.v.m. This page was last edited on 26 December 2018, at 16:33 (UTC).